Insecure always thinks, “What will everyone else think of me? How can I be popular? Am I pretty, smart and ahead enough? Grandma and Grandpa Squirrel give Secure and Insecure each a brand new sewing machine, patterns, colorful cloth, and thread for their birthdays. She starts reading the directions, cutting out patterns, and learning to sew with Mama’s help. She invites her friends over to use her machine too. Secure makes little dresses and little purses with the remnants for Grandma, her friends and herself. Her machine is well used and what fun they have! Then she puts her sewing machine on display in her room. She doesn’t want anyone to scratch or break her new machine. Next she hides the patterns, cloth and thread. Insecure’s machine is still beautiful, shiny and brand new. Does she have any dresses or purses? Did she have any fun? Aunt and Uncle Squirrel give both Secure and Insecure garden tools and seeds. Secure plants beautiful flowers and strawberries. Insecure doesn’t want her beautiful garden tools to get dirty. She puts them on display next to her sewing machine. Mama and Papa give both Secure and Insecure a brand new mixer and recipe book. Secure begins using her mixer. Soon the aroma of freshly baked bread, cakes, and cookies floats through the air. Friends from all around come to taste her treats. Insecure puts her mixer on display next to her sewing machine. Secure decides to deliver the leftovers to the less fortunate squirrels with Mama and her friends. Insecure doesn’t want to be seen in the poor neighborhood or with her Mama, so she sits at home. “My dear little Insecure, do you know why Mama’s arms are the way they are? Shortly after you were born, Mama risked her life saving you from Yanar Dağ! 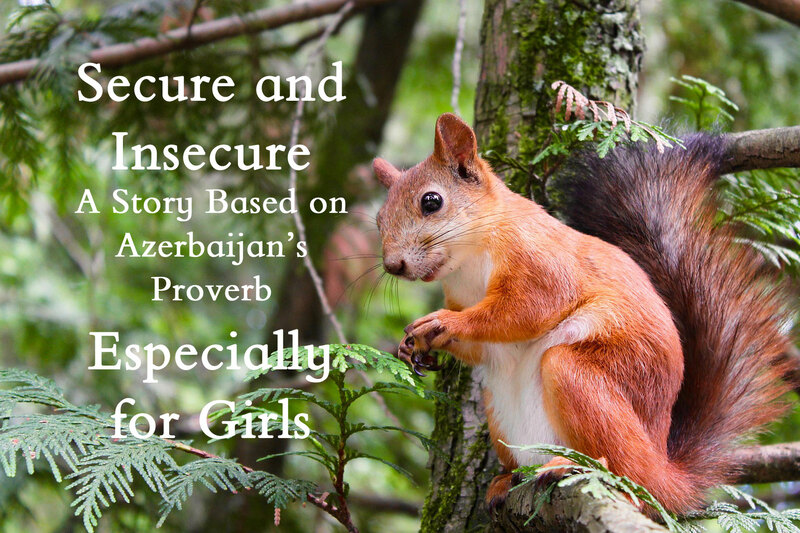 Mama knew the Azerbaijan Proverb: Beauty without virtue is a curse. Tears spill out of Insecure’s eyes. And do you know what? All her plans to do good, banish all anxious, nervous, and embarrassed thoughts from Insecure’s mind. She uses her sewing machine, mixer and garden tools to bring joy to others. And she isn’t Insecure anymore. She is Miss Confident.